What is the Romulan commander's name? In TOS: The Enterprise Incident, the female Romulan commander whispers her name into Spock's ear. COMMANDER: Yes. Yes, it will, Mister Spock. You do know I have a first name. SPOCK: I was beginning to wonder. SPOCK: How rare, and how beautiful. But so incongruous when spoken by a soldier. Does the canon give her name or is it in non-canon only? 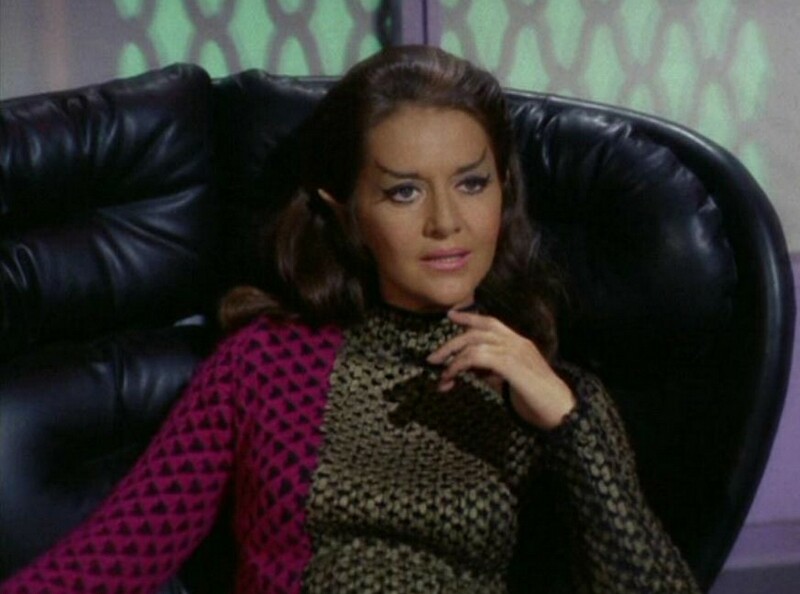 This Romulan Commander was played by actress Joanne Linville. The character whispered her name into Spock's ear, and he commented how "rare and beautiful" it was, but it was never spoken aloud. Some non-canon sources, such as authors Josepha Sherman and Susan Shwartz, as well as the Star Trek Customizable Card Game, list the character's name as "Charvanek." Authors Sondra Marshak and Myrna Culbreath list her as "Dion Charvon" in The Price of the Phoenix and The Fate of the Phoenix. Author Della Van Hise lists her as "Praetor Thea" in Killing Time. According to the Star Trek: The Next Generation Companion, Naren Shankar suggested bringing back the Commander in "Face of the Enemy". However Linville was unavailable, and thus the character of Toreth was created instead. The Romulan Commander's name is never spoken out loud. While this is a negative that's hard to prove, all I can say is the local networks used to re-run Trek late at night and would let episodes run over the time slot so the entire episode could play out without anything cut. At the time video tapes decks were for professionals, but I had a cassette tape recorder I used to record a number of episodes, including The Enterprise Incident. I listened to it many, many times (I had no life as a teen in the 1970s and 1980s) and almost memorized it. Her name was never mentioned in the episode. As to later discussions, while there may have been brief references to the episode (such as comments about Romulans and cloaking devices), the Commander was never mentioned again. (I watched for it!) For a series in the 1960s, that was normal for a TV series. At that time most shows made each episode a stand-alone with very little references to other episodes. In the movies or later live action shows, there was never any reference to this event at all, much less to her name. As I reember, there was a fan parody of the episode in Trek magazine and the Best of Trek books, where the Romulan Commander said her name was "Trampolina". I also remember that there was an article in Trek which stated that different novels gave five different and inconistent stories about the Romulan Commander's fate after "The Enterprise Incident". Reading all of the novels mentioned might lead to another name or two for her. Not the answer you're looking for? Browse other questions tagged star-trek star-trek-tos names or ask your own question. What planets in the Romulan system survived the supernova? What is the etymology of Spock's name? What happens to old Romulan ships? What made Romulan Ale Romulan? Why are the crew surprised at Romulan cloaking technology in the “Enterprise Incident”? Did Kirk's captaincy of the Enterprise have a canon starting date in TOS?